Become an Affiliate of WTK Network Software and earn commission for every WTK Network Software sale that you bring to us. There is no fees or minimum referral requirements. Just register as an affiliate, promote your affiliate link on Social Networks, Blogs, Forums, Classified Ad sites, Websites and earn commission on sales. 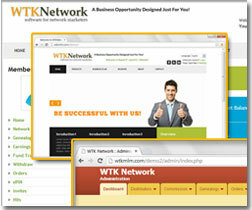 You will get $30 commission for every WTK Network Software sale. Each month we will pay the commission earnings to you through Paypal, Skrill or Bank transfer (Minimum $100). Become an Affiliate and Start Earning Right Away! After Signup, click on 'Affiliates' menu link. Click on 'Activate Affiliate Account' button. Once Activated, you will get the custom affiliate link which you can start promoting & track the visitors referred count, signup(sales) count etc.